Chalk one more futuristic technology promised by Back to the Future 2 off the list. A Missouri TV station is reporting that a local company has created robotic, drive-through gas station pumps capable of fully servicing your fuel tank without you needing to get out of your car. You'd pay for your purchase via the pump's screen, or by using an app on your smartphone. Transactions happen an estimated 30% faster than they do with manual pumps. 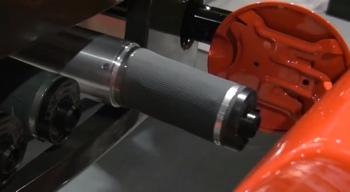 You can see the automated fuel pump in action in the video below. Don't expect the robots to bring big savings at the pump. The devices, manufactured by Husky and Fuelmatics, cost about $50,000 each. That's quite a bit higher than the cost of traditional fueling station pumps. Husky suggests the tech would best be used by "those looking to stand out in highly concentrated, competitive situations," which we suppose could apply to a service station on Hill Valley's Main Street. Robotic, automated gas stations are only one of many futuristic items Back to the Future 2 suggested we’d be enjoying by the time Marty McFly arrives in October 21, 2015. Some technologies, like video chat, glasses-free 3D and hoverboards have already become a reality. Other promised technologies, like flying cars, still remain long out of reach.